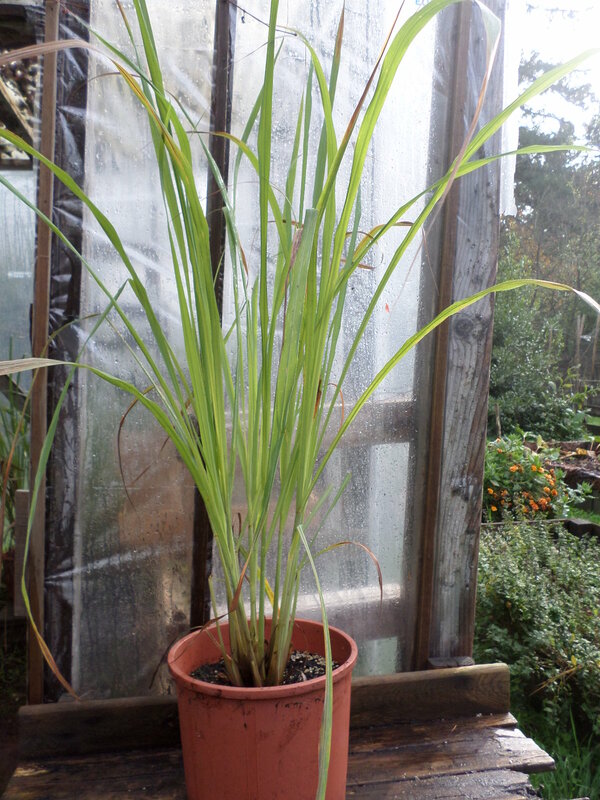 I’ve been growing Lemongrass for a couple of years now. I love all the citrus scented herbs and just love strolling by them, giving them a squeeze and smelling them. Lemongrass has a sharp lemon flavour and fragrance. I bought my original lemongrass at Hazelwood Herb farm. I kept it potted and in the greenhouse through the first spring and summer and it grew immensely. Last spring, I divided one of my two plants into about 5 pieces to see if I could successfully divide them. I kept the other intact, just in case I killed the others. 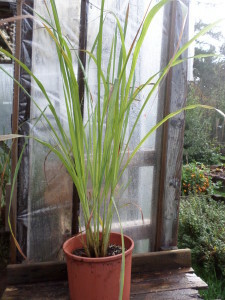 However, I now have 6 large lemongrass plants all of which I can easily harvest from and have lots of lemongrass to use. This winter I do not have space in my house for 6 large plants, so I’ve left them in the unheated greenhouse, so far they’ve survived quite heavy frosts. You can harvest stems anytime, once the plants are a foot tall. They will grow about 1 m high, and mine are about that tall. If you had warmer conditions in the garden, they can spread into quite a good-sized clump about 1 m wide. Otherwise keep them potted so you can move them to a warmer location for the winter. Later in the spring, if any local readers would like part of a plant, just let me know. You can use leaves fresh, dried or frozen and the stems in Thai and Vietnamese dishes. You can use the leaves in mixed herbal teas. They can add a lemony fragrance for potpourri. I have used the Lemongrass in drinks and some recipes. 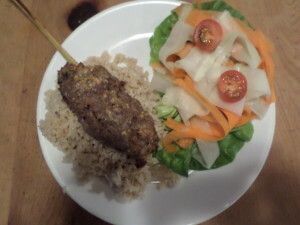 One of my favorite recipes using lemongrass was Lemongrass Chicken Skewers with Coconut Rice and Cucumber Carrot Slaw. You use the lemongrass stem as a shish kebab stick in the following recipe. The flavour was subtly throughout the meat. It was very popular with the family.